The ESMH-DC is an advanced motorized test stand offering all the mechanical specifications of the ESMH. This horizontal test stand, with a capacity of 50 lbF, is designed for tension, compression, and friction testing. 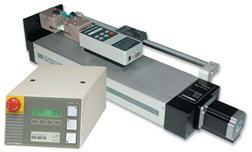 A smooth top surface makes this tester particularly well suited for coefficient of friction testing. Other typical applications include the testing of sealed pouches, fabrics, tubing, sutures, and many other items in virtually every industry. The tester features integrated limit switches for repetitive testing or other tests where travel limits are required. Modular design accommodates a wide variety of test sample shapes and sizes. The ESMH-DC's controller adds a significant amount of sophistication, including an extended speed range, PC control capability, programmable cycling, auto return, overload protection, and other features. 12" [300 mm] travel, 0.0005" [0.01 mm] resolution, 0.001" [0.03 mm] accuracy, SPC output for automated data collection. For output of travel data to a PC, the following items are required: 09-1066 cable and MRS100A communication adapter. Connects a Series BG force gage to the controller. This single cable is used to transmit set points, overload signals, and force data. Bi-directional communication with a PC for computer control. Also sends force data from the controller to a PC. Connects a Series BG force gage with a PC. Bypasses the controller. Protects a force gage against overload (requires a Series BG force gage and 09-1143 multi-function cable). The user programs the desired percentage of full scale of the gage. Adjustable analog output voltage setting allows the test stand to interface with virtually any force gage with analog output. The crosshead moves to a limit switch or force set point (requires a Series BG force gage), stops, and reverses direction at maximum speed to the other limit switch or set point. The crosshead moves up and down between limit switches or force set points (requires a Series BG force gage). Configurable up to 99,999 cycles. Dwell time allows the operator to program the amount of time, up to 9,999.9 seconds, 0.1 second intervals, for which the crosshead pauses at limits. LEFT and RIGHT button operation can be configured in three user-configurable modes: Maintained: a short push produces continuous motion until STOP is pressed; Momentary: crosshead moves only while the button is pressed; and Auto: short push produces maintained motion, while holding down the button will produce momentary motion. * Contains no integrated travel measurement. Travel information available only through the external ESMH001 digital travel display, requiring an additional serial port on the PC. For an integrated solution with full PC control, including travel distance, see test stand model ESM301.